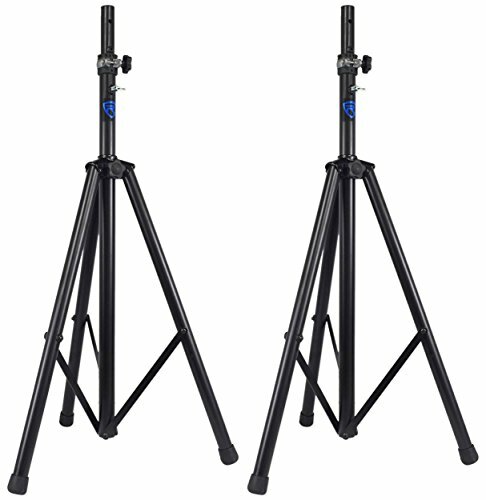 The Rockville RVSS4A is an air charged Pro Audio Speaker stand with automatic lifting and and lowering system. The center pole features an air cartridge which helps to accommodate both the lifting and lowering of any speaker with a weight capacity of 154 pounds! The system height can be adjusted from 42" to 79". The air assist technology is something every sound person and musician should own. It makes it extremely easy and convenient to place speakers on stands. Rockville RVSS4A Tripod Speaker Stand With Air Lift and Lowering System. Hydraulic System Makes Raising and Lowering The Speaker Quick, Painless, and Safe. Air Assisted Lift allows the speaker stand to raise with the push of a button. Air Assist lowering system lowers the speaker for easy dismounting with the push of a button. Easy Hand-Clutch Mechanism For Air Powered Lift. Easy Hand-Clutch Mechanism for Slow Air Powered Decline/Lower. Built in Pole Track Mechanism To Keep Speaker Pole From Rotating. Adjustable Height 42" - 79" inches. Heavy Duty Steel and Aluminum Composite Construction. Lightweight construction allows for easy maneuverability and travel.